One of the things I noticed soon after moving to Bratislava was that the larger area of the Stare Mesto (that more or less encircles the pedestrianized historical center), which is a mishmash of architectural eras and styles from medieval to Habsburg to communist to contemporary, has a number of historical buildings that are in serious states of disrepair. These buildings are not merely dilapidated - they're literally falling apart, with boarded up windows, gutted interiors, large cracks and chunks of missing plaster, etc. They are probably condemned and uninhabitable to anyone but the bravest of squatters. Don't get me wrong, I like a little dilapidation. There's something romantic about when these old buildings actually show some signs of their age. That's what makes streets like Kapitulska or Konventna so appealing and actually kind of preferable to much of the pedestrianized center which, if anything, is a bit too whitewashed. But I'm aware that at some point those cracks and holes need to be filled, and those facades need to be painted so as to prevent these buildings from disintegrating beyond the point of repair. 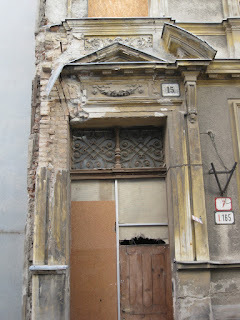 You might remember my post about Kapitulska, a beautiful street in the historical center with several very old buildings that are on the verge of collapse, for which very little is being done beyond minimal bandaid repairs. But with Kapitulska, we know why these buildings are in the state they're in: the catholic church owned many of them, but they were seized by the state during communism and basically neglected for 40 years. When the church got them back, it lacked the money and/or the incentive to restore the buildings, yet it has been reluctant to sell them to developers. So they're just sitting there deteriorating. As for the buildings just outside the pedestrianized historical area, there are probably a variety of reasons as to why they are being neglected, although in the end I'm sure it all comes down to money (or lack thereof). Below are several such buildings that have caught my attention. 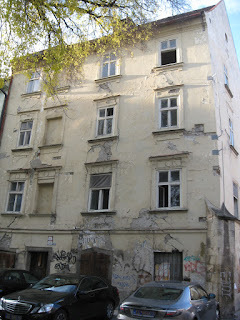 This sad building on Namestie 1 maja is now an entrance to a parking lot that's in back of it. If you look closely, you'll notice the facade has been covered in chicken wire netting to prevent falling chunks of plaster from hitting passersby. This is not an uncommon site in Bratislava. What strikes me as odd about these buildings is that one would think that, given their relative scarcity and unique beauty, they would be highly valued and that developers would be falling over themselves for the chance to restore and renovate them into stylish residential flats or office spaces. 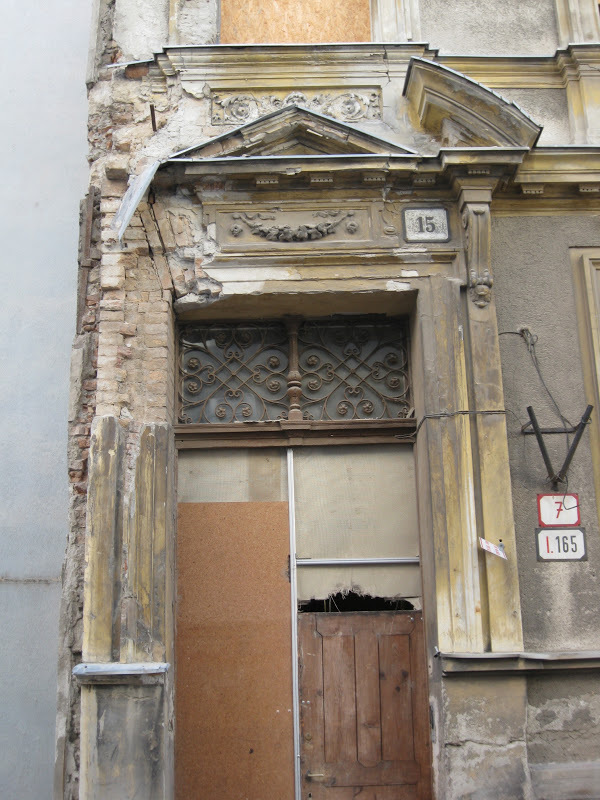 This has happened with many of Bratislava's historical buildings to varying degrees, but I worry that these particular buildings might be too far gone to bring back to life; the repair work they need may be so severe as to render them unprofitable. Restoring historical buildings is enormously costly, and some of these buildings could conceivably turn into a financial black hole. This building and the one in the photo below sit next to each other on Panenska, a cool historical street that sits a couple of blocks outside the pedestrianized historical center. This building's not totally boarded up yet, but it could soon wind up that way, just like its next-door neighbor, above. I'd love to know who owns these buildings. Were they returned to their rightful owners after communism ended? If so, are the owners just sitting on them, waiting for the market to pick up, or do they want to restore them, and simply lack the funds? Or, were the owners or their descendants nowhere to be found, leaving these buildings under state control? If it's the latter, that could explain a lot. Still, it seems wrong to me to just let these buildings languish. I wonder if there is some state or EU aid that can be tapped for restoring historical buildings. This sign is telling people to watch out for falling chunks of plaster. If you look carefully you can see signs like this affixed to some of the older buildings around town. If you look close you'll see that this highly visible structure on the busy corner of Stefanikova and Palisady is actually two buildings that are attached. The one on the right is not only boarded up, but adding insult to injury, it's being used as a colossal billboard, which is wrong on so many levels, and a prime example of Bratislava being literally swallowed up by hideous billboard advertising. 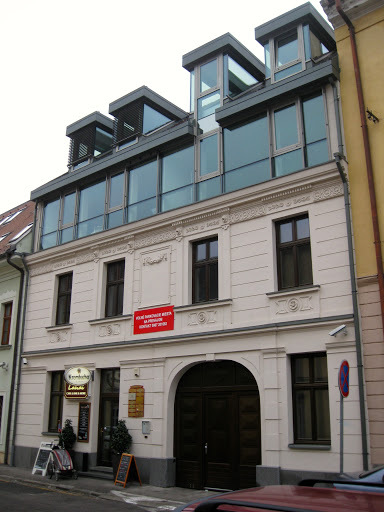 This building is actually right in the heart of the pedestrianized historical center, a short block away from Hlavne namestie, the main square. 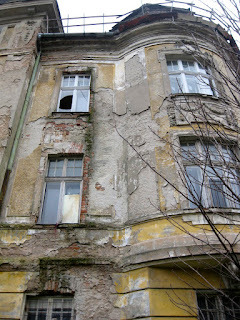 This is the only building in the historical center that I can think of outside of Kapitulska that is uninhabitable. Sad! What's odd about this is that in other historical European cities, like Florence, Siena, Prague, or Vienna, you really don't see buildings like these that are on the verge of collapse. They've all been restored or well maintained, and one gets the impression that there's just no way anyone would have allowed that to happen in those cities. But in Bratislava, it seems that a lack of money, and perhaps even a lack of motivation or interest, is a major obstacle. Not sure what's going on with this building on Jozefska. Someone clearly started adding another level, but this gutted building has been sitting like this for a while. I've strolled by several times and have not seen anyone working on it, but who knows. Some projects move at a snail's pace. Also, who knows if the upper level, if completed, will cohere to the historical style of the first two levels; historical buildings with jarringly incongruous modern add-ons are not uncommon sights in this town. This palatial house, located on the corner of Sulekova and Zrinskeho, a block up from Palisady by the cemetery, is pretty amazing, yet sadly neglected. There doesn't appear to be anyone living in it, and even the gates in the front are padlocked. A close-up of the building above. Looking pretty rough. Part of why I care about this issue so much is not just because I really dig historical architecture, but that Bratislava already lost enough of its history during communism and even in the post-communist era. Communist panelaks and glass and steel shopping centers and office buildings have been encroaching on the historical center for decades. As a result, Bratislava's historical center is woefully small when compared to other cities (which in my opinion is a major reason why it doesn't attract as many tourists), so you'd think it'd be really important to preserve what's left. See the building on the left? It's gone. Totally demolished. 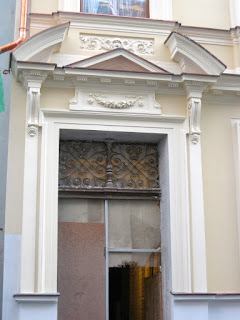 Now, even though it was not as attractive or unique as the building with the crumbling neoclassical facade next to it, it was still a nice building, and the fact that it's gone is basically my worst fear realized. The building next to it is in pretty rough shape, but at the time of writing, people are living in it, despite the fact that a wooden cover had to be put up over the sidewalk to prevent chunks of plaster from falling off and hitting passersby. However, I can end this post on a somewhat hopeful note. This attractive, and until recently crumbly, building behind the US Embassy is currently getting a thorough restoration. Check out these before and after shots. This is how it looked last January. The new addition on top is questionable, at least as far as historical authenticity, but it could be worse. Detail of the front door.